Reports this week are saying that ex-Buccaneers QB Josh McCown visited the Browns training ground in Berea on Tuesday and Wednesday and is said to be contract talks. McCown has been a backup for most his career in the NFL and is the brother of former Cleveland QB Luke McCown. 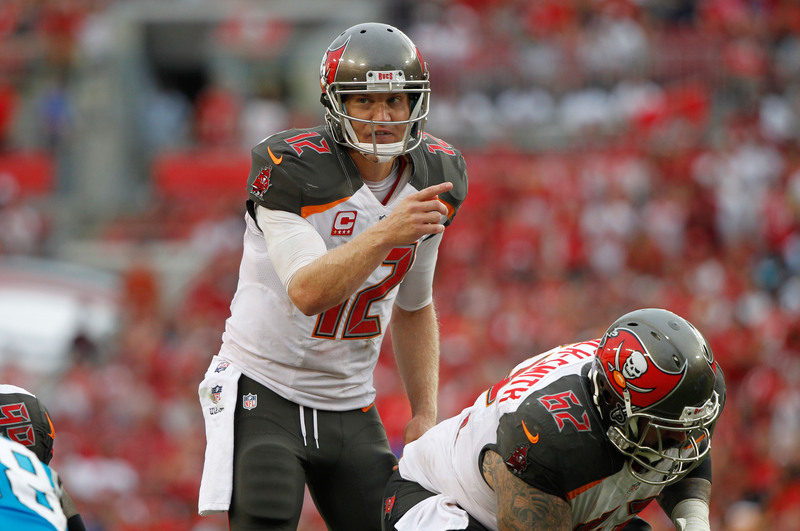 McCown was let go after one dissappointing season with the Buccaneers after going 1-10 in his games he started throwing 11TDs to 14INTs. If the Browns were to sign him, I would have serious doubts about how effective he would be and with his age he could not be expected to play more than one or two years. McCown has experience with the Browns new OC John DeFilippo playing under him in 2007 and would be able to help him implement his new scheme. 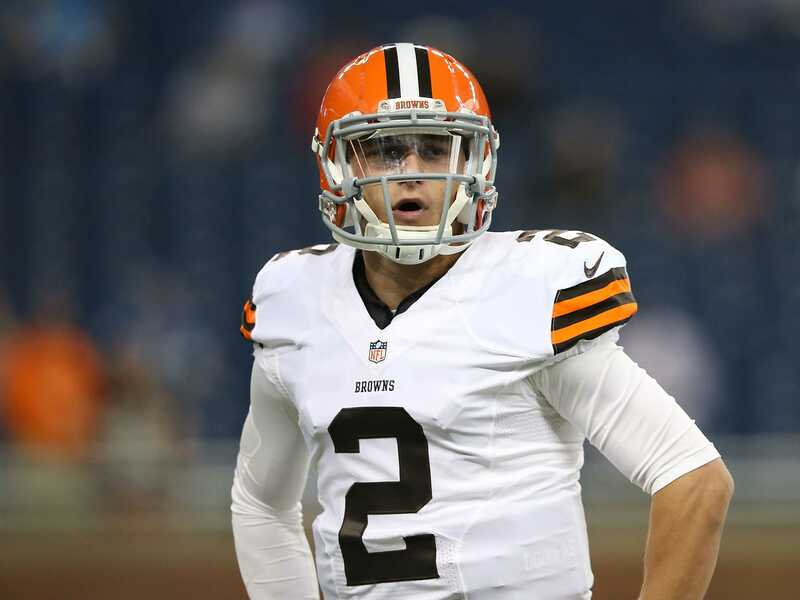 If he were to be signed by the Browns, the hopes would be that he would be a mentor for the Browns two sophomore QBs, Johnny Manziel and Connor Shaw. If the Browns were to sign McCown it would have to be seen as a damning sign for QB Brian Hoyer as there is no realisitic way that the Browns could carry 4 QBs into next season. After getting released by the Buccaneers on February 11th, McCown has been busy visiting Buffalo, Chicago and the New York Jets as well as the Browns. The Bills in particular are keen to bring in McCown with first round bust EJ Manuel being the only QB under contract for next year. McCown also has experience with Bills OC Greg Roman and QB coach David Lee. At a press conference today the Browns released their “new” primary logo and a changed secondary logo to incorporate more of the Dawg Pound spirit. The only main change to the Brown’s primary logo is the shade of orange has been made brighter. Meanwhile the secondary logo has been changed from a straight on view of a brown bulldog. The new logo is more of an outline of the bulldogs face against an orange background with the words Dash Pound inscribed beneath. For the amount of hype the Browns made about it, it is fairly surprising how little change there is and to be honest I’m glad.I’m glad there was no real change from the helmet but I think the bulldog logo just doesn’t work. It is supposed to look intimidating but just really fails to and it is a bad reflection on the Dawg Pound and its reputation. On the uniform front they said the uniforms will be released before the draft. There is a Sherwin Williams’s advert that describes the colours the Browns wear burnt orange, seal brown and gunmetal grey and how you can get these and more colours at your local Sherwin Williams. While obviously there is commercialism behind the ad there is a certain sentiment behind it that is shared with most Browns fan. Cleveland is a blue collar city and the Browns uniforms reflect that with the Browns uniforms being one of the few constants in an ever changing league. The team is named after Paul Brown and not the colour but it’s not by chance that they wear the colour in their name either. The only change since the Browns have returned has been the removal of the AL from the sleeve after Jimmy Haslam bought the team off Randy Lerner (the AL was for Lerner’s farther Art). The Browns helmet is unique for being the only one without any logo. Yet all of this going to change come Tuesday. According to multiple reports, the Browns will unveil new uniforms add a new logo. The uniforms are going to be designed by Nike who have already given a do over to the Dolphins, Jaguars, Seahawks and Vikings uniforms and so far the jury is out on the redesigns. With Jimmy Haslam’s ties to the University of Tennessee as a booster is it fair to assume there will be more orange incorporated into the Browns uniforms with some leaked photos suggesting that the Browns will play in an all-orange strip with a grey trim. As for the logo there is no indication so far as to what it might be although rumours suggest it could be a move towards a bulldog icon to incorporate the Dawg pound. Although of course the joke has been made that a better representation would be to a dumpster on fire as the new logo.The only assurances Jimmy Haslam has given the Browns so far is that there won’t be a logo on the Browns helmet any time soon and that Brownie the elf won’t be making a comeback. Once the Browns maintain a logo less helmet and don’t wear a shade of orange that is toxic looking and manage to maintain some of the brown I think that most fans would be ok with it. Haslam has reportedly gotten assurance off Nike that the jersey would sell regardless. 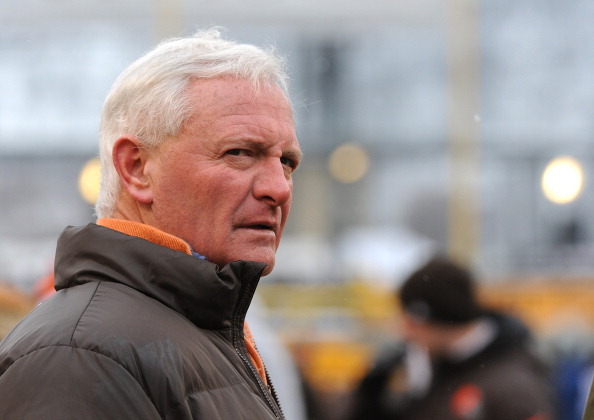 So far, Jimmy Haslam’s reign as Browns owner has been fairly tumulus with Chudzinski, Banner and Lombardi getting fired, Johnny Manziel, Textgate, the coaching search and Josh Gordon. Although to be fair to him the Browns have made strides under his leadership winning more than 5 games for the first time since 2007 but he still been far from the Art Rooney-like figure he was painted as when he took over. That was before he had the neck to raise the season ticket prices this offseason. The update of the uniforms is a part of large renovation project Haslam is working on with the stadium undergoing the second stage of renovation with the Dawg Pound, club suites and the scoreboards getting upgraded. Rumours suggest the reason Haslam wants to change the uniforms is because he sees the current ones as a “monument to failure” but after losing for all these in brown I think most fans would like to see us win in brown for a while although if this were the catalyst towards a new era of winning I wouldn’t be against it. Just don’t put anything on the helmet. Ever. Imagine a Browns team with their franchise QB, a Browns team without Johnny Manziel, Josh Gordon and Brian Hoyer. That franchise QB would have been Eagles QB Nick Foles and it was a heck of a lot closer to happening than anyone had previously thought possible according to a report from ESPN’s Phil Sheridan. 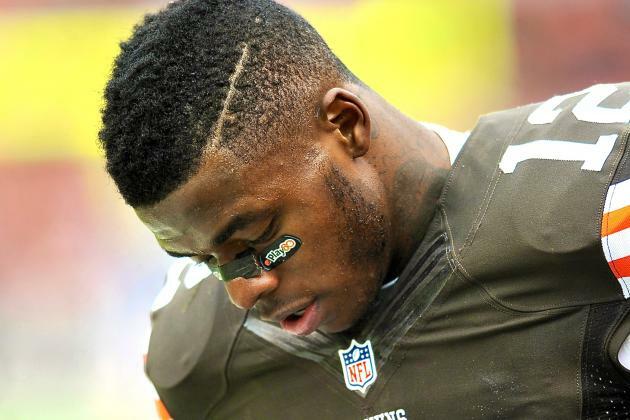 At the time it was a badly kept secret that then Browns CEO Joe Banner was trying to shop troubled WR Josh Gordon and he turned to his (Banner’s) former team, the Philadelphia Eagles and started to negotiate. His asking price, QB Nick Foles. 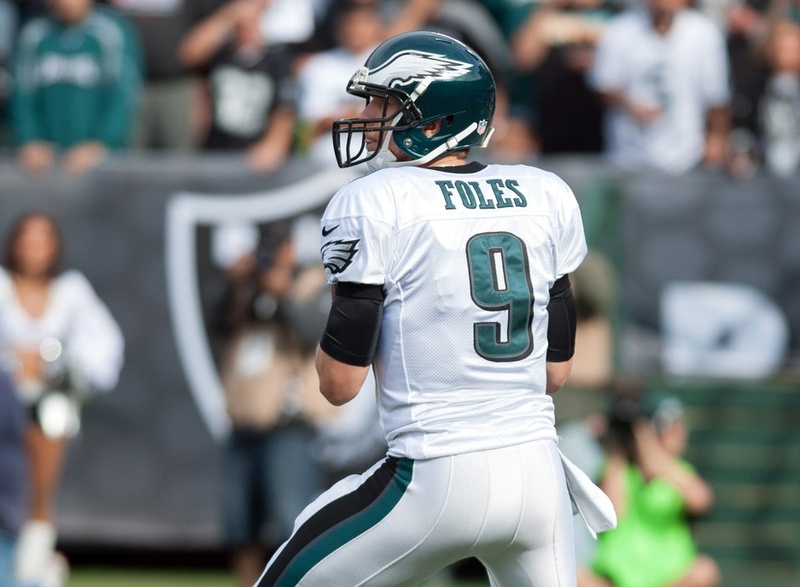 At the time, Foles had come off an up and down season rookie season where he started 6 games and threw 6 TDs and 5 INTs. When the trade was supposed to be going down, Foles had lost the battle for the starting job to Michael Vick. Gordon was coming off a more promising rookie season with 805 yards and 5 TDs. At the time, Philadelphia had just lost starting WR Jeremy Maclin to an ACL tear and trading for Gordon would have meant they had a nice compliment to DeSean Jackson in the passing game and the Eagles had just drafted QB Matt Barkley in that year’s draft. In the end, Chip Kelly decided to pass on Gordon due to the potential of further suspension (unfortunately he was right) and because the Eagles staff were high on Foles as a long term replacement to Vick. The Eagles also felt cautious about Vick’s potential to stay healthy for the entire season and were hesitant to bring another troublesome character into a locker room that had a divisive figure in DeSean Jackson. In the end the Eagles were justified to avoid taking on Gordon despite Gordon going onto have a league best 1646 yards with Foles having an impressive season himself throwing 27 TDs to 2 INTs after Vick went down. Another interesting hypothetical that came out of this report is imagining where the Browns would be now if the trade had to go ahead. Foles almost certainly would started with Brandon Weeden and Jason Campbell being the backups which would have left Brian Hoyer as the 4th stringer and almost definitely meant he would have been cut. Also, there most definitely no Johnny Manziel in Cleveland and with the Browns lacking any clear no.1 wide out they probably stick with Sammy Watkins rather than trading that pick to the Bills. That’s assuming the Browns are still in the same place in the draft and don’t make any improvement despite the upgrade in QB. Finally and maybe best of all it means I wouldn’t have had to watch Brandon Weeden as the Browns staring quarterback. Is it time to part with Ahtyba Rubin? Every since the Browns decided to a flyer on Ahtyba Rubin and selected him in the 6th round way back in 2008, he has been a valuable member of the Browns defense and has started at least 11 games a year since 2010. While Rubin has been a valuable player for the Browns, he struggled pretty badly last season and with him surely going to be looking for at least $5 million a year, you’d have to wonder whether it is still worthwhile keeping Ahtyba Rubin around next season? Rubin is coming to the end of a four year/ $26.5 million contract which paid him $6.6 million last year and is due to become an unrestricted free agent on March 10. 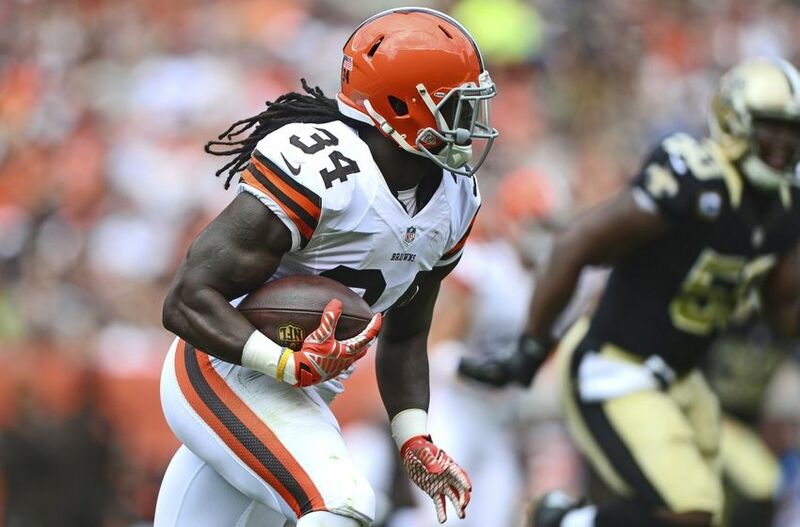 Rubin is 28 and probably wont be willing to accept any less for $5 million a year with him realizing this could be his last real payday but with how he played last year and with how he fits with the Browns scheme I really feel that he wouldn’t be worth that much to the Browns despite all the cap space they have at their disposal. It is three front offices(unfortunately) since Rubin drafted and this current on e would hold no loyalty for him in the way the front office that drafted him would. Rubin was schedule to start at DE this season but end up spending quite a lot of his season playing NT because Phil Taylor played only 5 games and to be completely honest he never really looked comfortable playing there. Rubin is more of a 4-3 DT and this showed last year with him being a liability in the run game being a major reason why the Browns finished dead last in the run defense giving up 141.6 yards a game on the ground. In the 3-4 the nose tackle is arguably the most important position when it comes to stop the run as he has the responsibility of both A gaps i.e. lining up directly opposite the center and taking up the either side of him which are the main lanes for any rushing plays. Rubin didn’t seem to be able to consistently to be able to take up blocks and help stop the run. 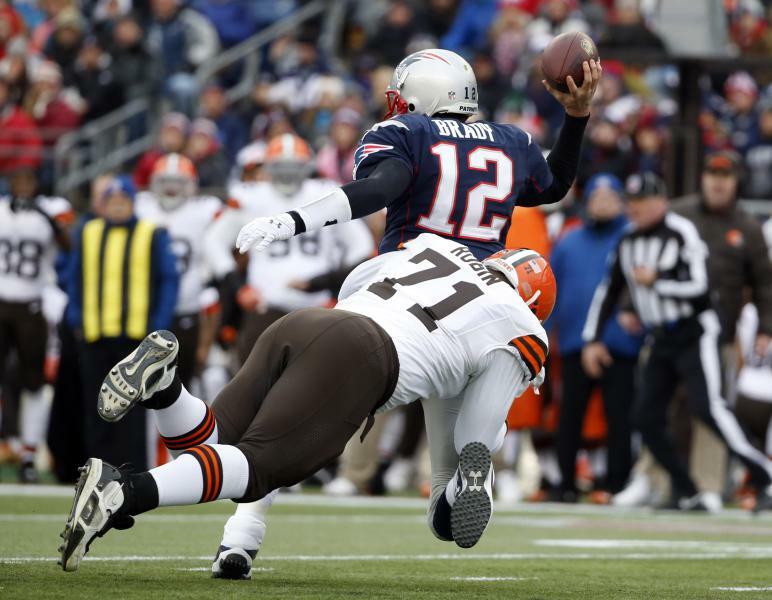 this proved to be a major problem for the Browns especially when their top linebacker Karlos Dansby went to injury. Another problem with bringing Rubin back would be that he could damage the development of talented young players such as Armonty Bryant, Billy Winn and John Hughes all of whom are under contract next year for a combined $2.1 million. At this stage of his career I feel we have seen the best that Rubin has to offer and it certainly is starter material in the right scheme and he really was a steal considering his draft position but not as valuable to the Browns as he used to be. With one defensive end slot for next year all but guaranteed for Desmond Bryant I think a committee approach between the three players or between Winn and Hughes with Bryant playing OLB would be more beneficial for the Browns. With Hughes’ and Winn’s contracts expiring at the end of next season giving them more playing time would almost certainly help in trying to resign them if that is what the Browns want. 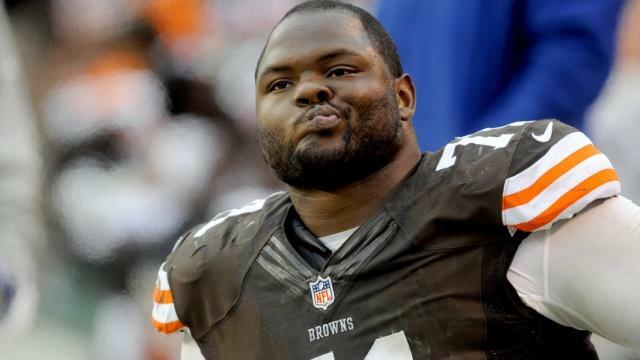 Another that could work against Rubin is that there is some rumors that the Browns are looking into moving Phil Taylor from nose tackle to defensive end and trying to find a new nose tackle in free agency or the draft. Moving Taylor to a more natural defensive end position would make an already crowded position even more crowded and Rubin more expendable. The Browns are expected to try and make a run at Lions DT Ndamukong Suh in free agency and with him expected to be asking for at least $16 million a year all the contracts the Browns could get off the books that better. That’s not to say there is no chance that there isn’t any chance of Rubin being back next year with the Browns having plenty of room under the salary cap with around $47.8 million available. Rubin certainly wouldn’t be bad as a backup for the Browns either as he can contribute and he has always worked hard throughout his career with Browns and would help to be an example of the “play like a Brown” motto that Mike Pettine was so fond of using this season. Although I have liked Rubin in the time he has been with the Browns and I wouldn’t mad if he came back I think his time with the Browns has come to the end of run. I think based on his performance last year, the abundance of young talent at the position and age I don’t see the Browns bringing back Rubin for another year. 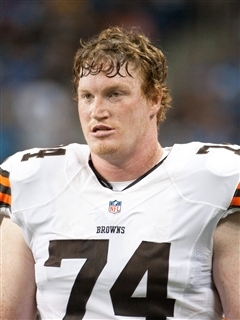 The Browns announced last night that versatile backup offensive lineman Paul McQuistan has released. McQuistan was signed last year as free agent on a two year, $3 million and played in 14 games with one start mostly on special teams. McQuistan’s salary for next year is not guaranteed so there will not any salary cap charge for next year. McQuistan, 30 will probably end up getting a job elsewhere next season as a backup. In the last two weeks, multiple reports have linked the Browns with Oregon QB Marcus Mariota with the reports saying that they would be willing to trade up for Mariota. These claims were boosted by the fact that the Browns new QB coach Kevin O’Connell is currently working as Mariota’s personal QB and will be until after the combine and Oregon’s Pro day. 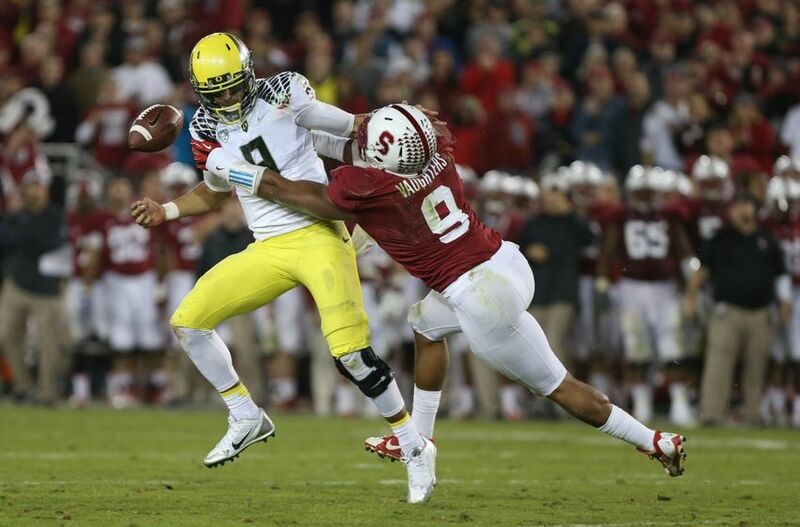 As of now, Mariota might be one of the most polarizing players in the draft. Mariota is a consensus top 15 and simply just will not stay on the board any longer that with the value of quarterbacks in today’s NFL. Its not off the where the issues lie like Winston’s, he was a role model and a scholar during his time in at Oregon. Its not about his physical skills as he very good specimen at 6’4” and 219 pounds with a 4.4 40 speed there no shortage of height or speed. Watching Mariota at Oregon, he really passes the eye test looking flawless and calm at all situations winning the Heismann trophy this but still looked a little questionable in a couple of situations. These situations are a cause for concerns especially his games against Stanford and this year’s title game against Ohio State. 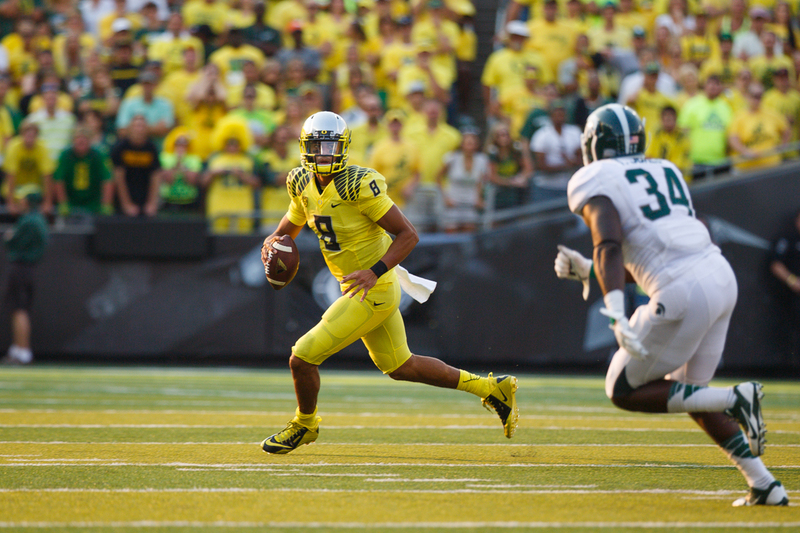 Mariota’s had a few injuries in his time at Oregon but nothing to get too concerned about. It’s adapting is what’s key with Oregon’s scheme being completely different to every pro team bar Chip Kelly’s Eagles and Mariota lacking any experience in a pro scheme. Mariota is a smart guy and and I do feel like he is the kind of guy who’ll learn the playbook by training camp, it just a big step and I can’t say that Mariota is ready for it. Jameis Winston might be a bigger risk with the off the field issues but schematically he is a good fit for most offenses in the league. Mariota comes from a system in a Oregon where the man three plays were a zone read, screen pass and a read option which the Ducks have used to great effect when running the offense at their lighting fast speed. He just not going to see that many of those plays in the NFL. From a Brown’s point of view it would be a curious move but if it were to happen you’d have to think that they would be a hundred percent certain that he was their guy and was able to make the transition. They have an in that no other team with soon to be QB coach Kevin O’Connell. O’Connell will work with Mariota until after Oregon’s Pro day on the 14th of March before linking up in the Browns. This gives the Browns a month and a half to weigh up whether it is worth moving up for Mariota and whether he is the long term answer at QB. Its not just Mariota they will have to judge as they have two young QBs under contract next year in Johnny Manziel and Connor Shaw and a decent starting QB in Brian Hoyer who is interested in coming back but just wishes to be paid. If they are going to try and move up they need to be a hundred percent sure that Mariota is the starter from day one, not in one or two years but right from the moment he steps in the door. Two first round picks is a massive price for any player especially when there are other needs which I would consider to be a bigger needs in NT and WR. For me I would consider it too much to give up without seeing what Connor Shaw and Johnny Manziel can develop into and contribute to the Browns. The price tag is just too much for a player with some question marks about his adaptability and especially if you need help elsewhere like the Browns do. That’s not to say I would against Mariota playing for the Browns if he fell down to 12th or even if fell to 7th or 8th and it was more affordable to make a move for him. Even if Mariota does begin to slide a bit I just can’t see him moving past the Jets at 6th. All I want for the Browns to be a hundred percent that Mariota will be an upgrade because this franchise of all franchises has had their share of QB pain. For years the stereotype of the Cleveland Browns has been of a dysfunctional organisation which changes it QB and coach almost annually and the last two weeks have done nothing to change that stereotype. If anything it has only made it worse with the circus that is Johnny Manziel, Josh Gordon and GM Ray Farmer. Here I am grudgingly going to sort through them. Johnny Manziel– While going into a rehab certainly can’t be seen as a bad move for him personally and professionally, it really makes you wonder what happened last year. Manziel, a rookie who had addiction problems so bad that he had to go to rehab to sort them out was chosen to start 2 games despite having a solid starter in Brian Hoyer. Rumours circulating since Kyle Shanahan left have been suggesting that he wanted to stick with Hoyer but he was forced to play Manziel by GM Ray Farmer, Owner Jimmy Haslam and others. I have heard some say that this resembles Brett Favre‘s career slightly with him going onto win three MVP titles in a row after having a stint in rehab for an addiction to painkillers. To compare them is natural with his similar kind of improvisational style but Brett Favre never went out partying in the same way that Manziel has. The hiring of Manziel’s personal QB coach Kevin O’Connell as the Browns QB is slightly dubious although Mike Pettine and John DeFilippo insist that he would have been chosen anyway and the main reason he was hired was because he worked with them in the past in his days as a backup QB with the Jets back in 2009 -10. Its kind of telling of who the Browns ownership and front office want as their starter. A plus point to this move though is the fact that he worked extensively with Marcus Mariota and also has some experience with Jameis Winston from his current job preparing QBs for the draft should the Browns make a move for either of them. O’Connell was a mobile QB himself who spent 5 years in the league and should be able to help Manziel adjust once he links up with him after the combine. For now I applaud him for trying to get help and sort out his life but you can’t help but wonder if he is a long term fit for the Browns. Josh Gordon– I’m struggling to even think where to begin with Gordon but I should probably start of with a recap. Gordon’s problems really started when he was at Baylor and got kicked out for failing three drug tests. He went on to spend a year at Utah without playing due to NCAA transfer rules before getting drafted in the 2nd round of the supplemental draft by the Browns. At end of his promising rookie season, Gordon got caught taking codeine which said came from taking a cough bottle. He was banned for the first four games but this was reduced to two and four game cheques on appeal. Upon returning, Gordon went on to lead the league in receiving and set multiple NFL and Browns records despite only playing 14 games.If that was all that happened then you might consider it somewhat acceptable but its what happens after the first suspension that is the real big problem. Last year, despite knowing that he was in the NFL drug system and that any kind of misdemeanor would get him suspended again he allowed himself to be in a situation where enough marijuana got his system that he failed an NFL mandated drug test. He strenuously denies that he smoked marijuana and said that the positive test was as a result of second hand smoke but when your lively hood rests on something as simple as not doing illegal drugs then you really got to questions why he put himself in that situation. It wasn’t like there wasn’t a reward for him staying clean with a prize of around $500,000 if he didn’t re-offend. That is before you even mention the DWI he got in N.C. during the same off-season. Then when he came back for the last two games he visibly wasn’t prepared for the NFL with him running wrong routes and causing Brian Hoyer to throw interceptions because he wasn’t where he supposed to be, with reports coming out from team sources that he didn’t know the plays or the playbook. Then despite having already served a 12 game suspension that season Gordon went ahead and got suspended for the Browns final game because he decided to go out and party the night before a game and got suspended for the Baltimore game along with rookies Justin Gilbert and Johnny Manziel. Then when he just could not seem to do anything worse he went away and failed yet another drug test. This time for alcohol after getting drunk on a flight to Vegas. Hardly a place for a man who should be keeping his head down. The result, a years suspension without pay. Gordon then penned a letter to respond to his critics but really it is too little, too late. It really makes you wonder when if ever Gordon is going to learn. Ownership– Finally the most bizarre of all and yet the most stereotypical Browns thing that could have happened. Reports began to come out in January at the same time that Kyle Shanahan asked for a release that a Browns staff member was texting a coach play calls on the sidelines. Now at the time I speculated that it was QB coach Dowell Loggains who had a very close relationship with Johnny Manziel and had shown a meddling streak when he texted Jimmy Haslam to convince him to draft Manziel. This week though news emerged that NFL is investigating GM Ray Farmer for texts he sent to Kyle Shanahan which is a violation of NFL regulations. The must likely outcome now is that Farmer will be find and that the Browns will lose a mid-round draft pick because of it but that is not the real issue here. Its the fact that it was even allowed to happen and the culture that must exist in the Browns front office. Really its got to start from the top where Jimmy Haslam must start to use some of the lessons he learned from the Rooneys during his time as a minority owner and help build a solid organizations where shenanigans like this don’t happen. That means taking a step back and let the coaches and front office do their jobs. He needs to stop the interfering that lead one owner to call him like “Jerry Jones with the football IQ” and needs to keep his business affairs clean if wants to stay an owner. GM Ray Farmer and team president Alec Scheiner need to learn that their jobs are on the personal and business sides respectively and not on the coaching side. Farmer should concentrate on getting the right pieces in and putting a good support structure in place for them so incidents like this stop happening. Mike Pettine and his staff need to be able to do their job because they clearly aren’t that bad leading the team to their best record since 2007. If the Browns can finally get all of this under control then maybe they’ll be able to shake the label of being the “same old Browns” and move on and become a more stable and successful organization.